Have you experienced tooth loss, whether due to trauma or some other reason? If so, you may be wondering what your options are—whether it’s denture implants or something else—and whether you can ever have the same smile you once did. The answer is yes, and it’s not nearly as difficult as you might fear! Are you a current denture wearer with a worn out set of teeth or have you just gotten to the point that you don’t want to keep trying in vain to save your bad teeth? Your options in our office start with our customized standard denture all the way up to implant supported teeth that are nearly like your original, real teeth. Making a quality denture restoration does not happen by accident. 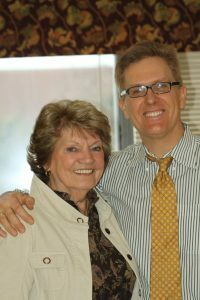 Dr. Haywood has 30+ years of denture experience and intensive study which allows him to provide expert level denture care. Quality denture care is a dying art. We have the solutions to your denture problems! With dentures, you can have a smile that looks good again in no time. What’s more, relative to other dental restorative procedures, getting a set of dentures is very affordable. Each of our denture patients has a special look they want to achieve. We custom design each of our dentures in-house, choosing teeth available on-site. No one in our area makes dentures like we do using the famous “Dr. 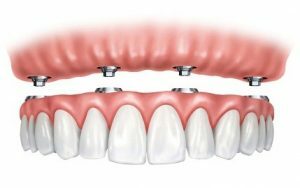 Turbyfill” denture techniques. Because we perform the design and fitting of your dentures at our office, we can produce dentures more quickly and accurately. If, however, we need to take more time to allow you to choose the look or color of your teeth, we can do that, too. Your satisfaction is our only concern. Some people wonder how having dentures will impact their ability to eat the foods they love. We are happy to tell you that once your permanent dentures are properly fitted and in place, our customized, “cosmetic” dentures should be the most comfortable denture you have ever worn. Dentures are never exactly like your original teeth. However most people can learn to wear them as if they were. We make our premium dentures with superior teeth and materials. Dentures can be both beautiful and durable lasting 20 years or more if they are designed correctly, and that is exactly what we plan on in each case! Many people envision dentures sitting in a glass of water next to their bed, perhaps like their grandparents had. 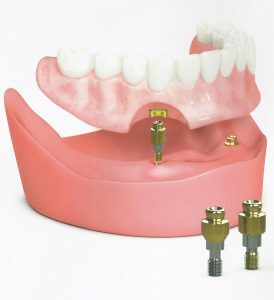 Today, Implant dentures can secure teeth permanently to implants that act like anchors for your new teeth. Implant supported dentures provide the secure fit, comfort and strong chewing forces people prefer over traditional dentures. This more advanced area of dentistry is preferred by many today seeking solutions for full tooth loss. We can create snaps that hold down your denture on a two or more implants-good. You can have a removable locking set of teeth on 4 or more implants- better. Or you can have a fully screw retained set of teeth that only the dentist can remove on 4 or more implants – BEST most like real teeth. You have heard about “teeth in a day” tm. In the media. We can do the same thing in every way. One thing to clarify is that planning for your new teeth takes time, but you can have your new teeth in one day even if we have teeth to remove. 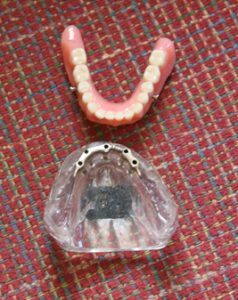 We have always fee consultations for implant denture cases. We are experts when it comes to dentures and other dental solutions. If you have any questions at all, please feel free to give us a call or come in and speak to the doctor directly in Shrewsbury PA! We’ll be happy to answer your questions and set up a time for you to come start the process of getting your new smile if you are in the York – New Freedom area! Free denture evaluation. With the All-on-4 permanent denture solution you get a free cone beam CT SCAN.